Deluxe Pirate fancy dress costume from a Real Plus 18-40. This costume is made to order so please allow approx. 1 week for delivery. 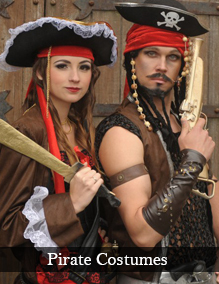 Deluxe Pirate costume includes a black shirt, striped black and white trousers, red neck scarf, belt, boot covers and black pirate hat with attached hair.